We provide a detailed protocol for a Drosophila melanogaster foraging path-length assay. We discuss the preparation and handling of test animals, how to perform the assay and analyze the data. Anreiter, I., Vasquez, O. E., Allen, A. M., Sokolowski, M. B. Foraging Path-length Protocol for Drosophila melanogaster Larvae. J. Vis. Exp. (110), e53980, doi:10.3791/53980 (2016). The Drosophila melanogaster larval path-length phenotype is an established measure used to study the genetic and environmental contributions to behavioral variation. The larval path-length assay was developed to measure individual differences in foraging behavior that were later linked to the foraging gene. Larval path-length is an easily scored trait that facilitates the collection of large sample sizes, at minimal cost, for genetic screens. Here we provide a detailed description of the current protocol for the larval path-length assay first used by Sokolowski. The protocol details how to reproducibly handle test animals, perform the behavioral assay and analyze the data. An example of how the assay can be used to measure behavioral plasticity in response to environmental change, by manipulating feeding environment prior to performing the assay, is also provided. Finally, appropriate test design as well as environmental factors that can modify larval path-length such as food quality, developmental age and day effects are discussed. Since the discovery of the white gene in Thomas Hunt Morgan's laboratory in 1910, the fruit fly, Drosophila melanogaster (D. melanogaster), has been used as a model for the study of the molecular and physiological underpinnings of various biological processes. The popularity of D. melanogaster largely stems from the considerable quantity and variety of genetic tools. Drosophila's small size, relative ease of handling and short generation time render it an ideal model for genetics studies. Equally important is Drosophila's capacity to demonstrate many of the phenotypes expressed by more complex organisms including mammals. This includes complex phenotypes such as behavior that stand at the interface between the organism and its environment. As such, behavioral studies on the fruit fly have contributed substantially to our understanding of how genes and the environment mediate behavior1. One of the first studies of D. melanogaster larval behavior investigated individual differences in larval foraging strategies by measuring the path-lengths of larvae2 while feeding. Path-length was defined as the total distance travelled by a single larva on yeast, within a five minute period. Both laboratory strains and flies from a natural population in Toronto varied in their foraging behaviors and there was a genetic component to individual differences in path-length. Two larval foraging morphs were described from the quantitative path-length distributions and they were called rover and sitter. Rovers exhibit longer path-lengths while traversing a larger area while on a food substrate than sitters. Using this path-length assay, de Belle et al.3 mapped the foraging (for) gene underlying these individual behavioral differences to a discrete location on chromosome-2 (24A3-24C5). The D. melanogaster for gene was later cloned4 and revealed to be a cGMP dependent protein kinase5, a modulator of physiology and behavior in Drosophila and other organisms6. Here we outline the current protocol for the larval path-length assay originally developed in Sokolowski2. Although some aspects of the assay have changed over the years, the concept behind the design has not. We also provide data to illustrate the assay's potential to assess genetic and environmental contributions to individual differences in the foraging behavior of Drosophila larvae. The larval path-length assay is simple, efficient, and yet robust. A single person can test up to 500 larvae with ease in four hours and results can be obtained with a high level of reproducibility. Originally developed to localize for, it can be used in genetic screens, quantitative trait locus mapping, and in studies of gene-by-environment (GxE) interactions. Moreover, its simplicity and reproducibility make it a great resource for undergraduate teaching. To make holding bottles, cut holes in one side of 6 oz fly culture bottles, large enough to fit a fly vial plug for air supply (Fig. 1D). To make grape plates, prepare 250 ml of grape juice medium (1.8% agar, 45% grape juice, 2.5% acetic acid, 2.5% ethanol) by boiling the agar, grape juice and most of the water, cool down to 70 ºC (stir while cooling), then add acetic acid and ethanol and bring up to volume with water. Use a syringe (without needle) to fill 35 x 10 mm Petri dish lids until the surface of the grape juice medium makes a dome above the lip of the lid (Fig. 1A). Store grape plates in a humid and airtight container at 4 ºC until use (up to a maximum of 2 weeks). Prepare standard fly food recipe. Note: To test rearing food quality effects on path-length we used low nutrient fly food: 10% sucrose, 1.3% agar, 0.8% potassium sodium tartrate, 0.1% monopotassium phosphate, 0.05% sodium chloride, 0.05% calcium chloride, 0.05% magnesium chloride, 0.05% ferric sulfate, 5% yeast and 0.5% propionic acid in water; and high nutrient fly food: 1.5% sucrose, 1.4% agar, 3% glucose, 1.5% cornmeal, 1% wheat germ, 1% soy flour, 3% molasses, 3.5% yeast, 0.5% propionic acid, 0.2% Tegosept and 1% ethanol in water. For both foods autoclave the solution and cool to 50 oC before adding the propionic acid, Tegosept and ethanol. Pour 40 ml of fly food into 100 x 15mm Petri dishes. Store food plates in a humid and airtight container at 4 ºC until use (up to a maximum of 2 weeks). Prepare 58 x 25 cm, 6 mm thick black Plexiglas plates with 10, 1 mm deep circular wells, 10 cm in diameter and arranged in a 2 x 5 design (Fig. 1C) to test larvae on. Note: Up to 30 larvae can be tested at a time if 3 or more of the above Plexiglas plates are available. Alternatively, larvae can be tested in Petri dishes, 10 cm in diameter. This option is much more laborious and allows for lower numbers of larvae to be tested. Obtain a black 39 x 8 cm, 6 mm thick Plexiglas spreader for spreading the yeast paste on the Plexiglas test plates. Prepare 100 x 15 mm Petri dish lids for recording larval path-lengths by separating lids from bottoms in advance. Keep rearing conditions constant throughout the entire assay (e.g., 25 ºC, 60% humidity and a 12:12 light:dark cycle on standard fly food). Raise parental population in same rearing conditions. Collect 100 - 150 females and 50 - 75 males and age them for 5 ± 1 days for optimal fecundity. Allow females and males to mate overnight in a 6 oz fly culture bottle with standard fly food. Transfer flies into a holding bottle and secure a grape plate (a small amount of fresh yeast paste on the grape plate will promote egg laying; Fig. 1B) over the top with masking tape (Fig. 1E). Leave bottles standing upside down (Fig. 1F), with the grape plate at the bottom to allow adults to lay eggs on the grape plate. Discard the first grape plate after 24 hr and place a new grape plate in the holding bottle. This will be the grape plate from which larvae are collected the next day. Note: Grape plates will have to be cleared of larvae 22 hr after being set up, set up plates so that they can be cleared early next day (e.g., set up plate at 12 pm and clear at 10 am the next day). It is advisable to discard the first grape plate to avoid any eggs that females might have been withholding and that might be advanced in development. Remove grape plates from bottles 22 hr after they were set up and place in a 60 x 15 mm Petri dish. Place a new grape plate with fresh yeast paste on the holding bottle. Clear and discard all larvae from the seeded grape plate using a dissecting probe. Incubate cleared grape plates for 4 hr in standard conditions. After 4 hr, pick 100 L1 larvae per strain from the grape plates and place on food plates. Place larvae on the food gently (without perforating the food and burying the larvae) and avoid crowding by distributing the larvae across the food plate. Incubate food plates until test animals are approximately 10 hr before the start of wandering. Note: At 25 ºC, 10 hr before wandering generally corresponds to 72 - 96 hr after hatching. The exact amount of incubation time should be determined before starting the experiment by collecting an initial set of larvae for each strain and recording the number of hours until the start of wandering (wandering larvae will move out of the food onto the sides and lid of the food plates). Note: If needed, the same parents can be used to collect larvae for 3 - 4 days of testing by repeating steps 4.7 to 5.5. Change the order in which strains are set up and tested across days to avoid a test order effect on path-length. Test the same "control" strain/strains each day of testing to control for day effects. If many strains are tested, stagger the set up and collection times of the larvae to allow for the testing of each strain at the appropriate time point later on. Dissolve dry-active baker's yeast in water at a 1:2 ratio (weight to volume). The finished yeast paste should be thinner than pancake batter, in a way that when lifting a spoon out of the paste, it drips and leaves behind ribbons on the surface of the paste that quickly melt away. Note: The consistency of the yeast paste is important and should be constant throughout the experiment. The exact yeast:water ratio might have to be adjusted depending on the brand and batch of yeast. Gently pick larvae of the first strain to be tested from the food plate using a paint brush. Collect larvae in a Petri dish and gently wash with water to remove all food. Quickly wash larvae with 1 - 2 ml of water and gently dab larvae dry with a laboratory wipe to avoid transferring any water when placing the larvae on the test plate. To avoid stress, keep larvae humid but not submersed in water. Arrange three test plates side by side and set a 5 min timer for each test plate. 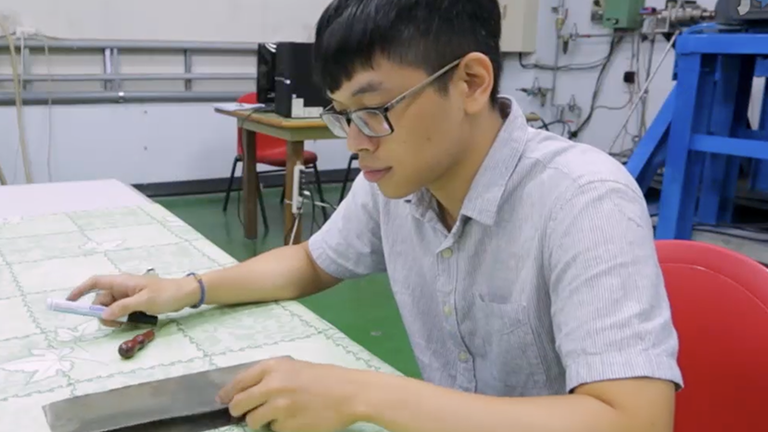 Apply yeast paste to the top of the test plates and using the spreader, spread a thin layer of yeast paste on each test plate so that all the wells have an even layer of yeast. Gently place one larva in the center of each well, starting the 5 min timer after placing the first larvae on each plate. Note: Three plates can be done at a time, yielding a sample size of 30/strain/test day, up to a total of 500 larvae. Place a Petri dish lid on top of each well. When the timer runs out, without removing the larvae from the plate, start tracing the path-lengths left behind in the yeast using a permanent marker. Trace path-lengths in the same order as larvae were placed on the test plates. Perform tracing at the same speed as larvae were placed on the plates. For consistency in later data analysis, use the same marker for all path-lengths. Permanent marker is recommended. Repeat steps 6.2 to 6.8.1 for each strain to be tested. Pick each strain from the food immediately before testing to avoid starvation effects on path-length. If larvae are to be food deprived prior to testing, collect larvae as described in steps 6.2 to 6.3, but the desired amount of food deprivation time earlier (e.g., if larvae are to be food deprived for 4 hr, collect larvae 4 hr before test time). Divide washed larvae into two groups and place the food deprived group in a 60 x 15 mm Petri dish with 5 ml 1% agar and the control group in a Petri dish with 5 ml standard food. Place a weight on top of the inverted lid of the Petri dishes (otherwise larvae are able to crawl out when searching for food). Incubate for the previously established food deprivation period and proceed with testing as described in steps 6.2 to 6.9. If many strains are to be tested, stagger the food deprivation start times to allow for testing of each strain at the appropriate time point. Note: This section describes a method for data analysis using ImageJ7 or Fiji8 for processing of path-lengths, although other software can be used. Use a light table to transfer all traced path-lengths from the Petri dish lids to white paper (lids can be washed with ethanol and reused for further path-length recording). Trace a 50 mm straight reference line on one of the sheets of paper. Scan the path-lengths at a resolution of 300 dpi and save as bitmap or tiff image files. Open the image file, select the "Process" tab > "Binary" > "Make binary". Then under the "Process" tab, select "Binary" > "Skeletonize". This produces a one pixel width line, regardless of thickness of trace. Make sure each path-length appears as a continuous single line with no crossovers. Separate any intersections using the "Straight line tool" and coloring the line white (the continuity of the path can be checked with the "Wand" (tracing) tool, the entire path should be highlighted yellow (Fig. 2). Select the "Analyse" tab > Set measurements and select "Perimeter" and "Display label". Select the "Analyse" tab > "Set scale" and select "Remove scale". On the image, select the reference line only, select the "Analyse" tab > "Analyse particles" and select "Show: Outlines", "Display results" and "Clear results table". Note: The output will show the number of pixels corresponding to the 50 mm scale line. Select "Analyse" tab > "Set scale" and fill in the pixel number in "Distance in pixels" and the corresponding distance (50 mm) in "Known distance". Finally, select all the path-length drawings of one genotype at a time, select the "Analyse" tab > "Analyse particles" and select "Show: outlines", "Display results" and "Clear results table". Remove any written labels or obvious extraneous markings (they will be recognized as path-lengths) within the selected area by selecting the area and filling it white. Visually inspect the "Outlines" output file to ensure the perimeters were correctly ascertained. The output will show a path-length in mm for each path-length drawing in the selection. This can easily be exported to a spreadsheet and analyzed with any statistical software. Differences in path-length of the rover and sitter for strains and the effect of food deprivation on path-length are illustrated in Fig. 3. Data collected over three consecutive days of testing showed a significant strain effect (F(1,421) = 351.89, p < 2.20 x 10-16; Fig. 3A), with rovers traveling farther than sitters. In addition to the strain effect, there was also a significant food treatment effect (F(1, 421) = 461.62, p < 2.20 x 10-16; Fig. 3A), with larvae that were food deprived for four hours prior to testing having significantly lower path-lengths than fed larvae. Furthermore, the ANOVA showed a significant strain by treatment interaction (F(1,423) = 9.78, p = 2 x 10-3), meaning rovers and sitters responded to food deprivation to different extents. Although the data above also showed a significant effect of test day (F(2,420) = 7.22, p = 8 x 10-4; Fig. 3B - 3C) there was no significant strain by day interaction (F(2,846) = 2.32, p = 0.10), meaning that day affected rovers and sitters similarly. Nevertheless there was a significant day by treatment interaction (F(2,420) = 8.07, p = 4.00 x 10-4), showing that the effect of treatment varied across days. The rearing quality of the food also had a significant effect on path-lengths (Fig. 4). Overall path-lengths were longer when larvae of both strains were reared on our high nutrient food compared to low nutrient food (F(1, 352) = 126.38, p < 2.20 x 10-16). Rover-sitter differences however were still maintained despite the food quality during larval rearing (F(1, 352) = 94.89, p < 2.20 x 10-16). Day effects which were significant (F(2, 351) = 3.77, p = 0.024) were included in the statistical model. Furthermore, there was a significant strain by day interaction (F(1,704) = 7.15, p = 9.00 x 10-4), as well as a significant food by day interaction (F(1,704) = 5.06, p = 7.60 x 10-3). Finally, it is important to note that the relative rover-sitter differences were significant across day, food quality and food deprivation effects, but that the absolute path-length measurements differed between days and treatments. These results not only underline the robustness of the larval path-length assay, but also the importance of controlling for rearing conditions, running every strain/treatment of interest on every day of testing, and factoring in day effects into the analyses. Figure 1. Preparation of Holding Bottles and Testing Plates. (A) Grape plates for egg laying should be filled above the rim to form a smooth dome of media. Addition of a small amount of fresh yeast paste (B) promotes egg laying. (C) Plexiglas testing plate with edged in wells and spreader. (D) Fly culture bottle with hole cut in for air supply. After transferring parental population to the culture bottle, grape plates should be fitted over the opening with masking tape (E) and bottles should be positioned with the grape plate at the bottom (F). Please click here to view a larger version of this figure. Figure 2. 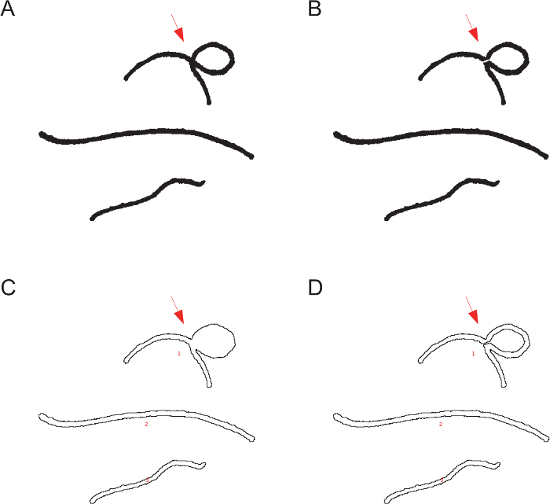 Image Analysis of Convoluted Path-length Traces. Path-lengths where larvae have crossed over their own path should be manually separated at the intersection to generate a single continuous line. (A) Shows an example of three scanned path-lengths, with a red arrow pointing at the intersection point of the top path-length. (B) Shows the same path-length edited in ImageJ to separate the intersection. (C) Shows the ImageJ perimeter output of the intersecting path-length, with erroneous assessment of the perimeter of path 1 due to the intersection. (D) Shows the ImageJ perimeter output of the edited file with the cleaved intersection and correct assessment of the perimeter of path-length 1. Please click here to view a larger version of this figure. Figure 3. Fed and Food Deprived Rover and Sitter Larval Path-lengths. Mean larval path-length (millimeters ± SEM) for rovers and sitters, demonstrating: (A) Pooled path-lengths for fed and 4 hr food deprived larvae over three consecutive days of testing, 105 < n < 120; (B) Fed larval path-lengths by day 38 < n < 40 per day; and (C) 4 hr food deprived larval path-lengths by day, 38 < n < 40, per day. All larvae and parents were reared on low nutrient food at 25 ºC, 60% humidity and a 12:12 L:D cycle. Differences between test groups and/or treatments were assessed by analysis of variance (ANOVA) and Tukey's test for post-hoc pairwise multiple comparisons. For (A) a blocking factor of day was added to the model. Letters represent statistical groupings; means with the same letter are not significantly different (p < 0.05). Fed and FD stand for fed and 4 hr food deprived conditions. Please click here to view a larger version of this figure. Figure 4. Food Quality and Larval Path-lengths. Mean larval path-length (millimeters ± SEM) for rovers and sitters, demonstrating path-lengths of larvae grown on high and low nutrient food. Data pooled over three consecutive days of testing with a blocking factor of day added to the statistical model, 75 < n < 90. All larvae and parents were reared on low or high nutrient food at 25 ºC, 60% humidity and a 12:12 L:D cycle. Differences between test groups and/or treatments were assessed by analysis of variance (ANOVA) and Tukey's test for post-hoc pairwise multiple comparison. Letters represent statistical groupings; means with the same letter are not significantly different (p < 0.05). High and low stand for high nutrient and low nutrient food quality. Please click here to view a larger version of this figure. The path-length assay outlined here offers a robust and simple measure of foraging behavior of Drosophila larvae. The protocol follows the general methodology described in Sokolowski2, but has since been improved in regards to efficiency and experimental controls. To the best of our knowledge this method is the only available method for measuring larval path-length. The original version of the path-length protocol2, 3, 15, 16 tested larvae on Petri dishes with a thin layer of yeast paste applied with a brush, and later a glass spreading rod. More recent versions of the protocol10, 17 transitioned to using the Plexiglas plates described here. 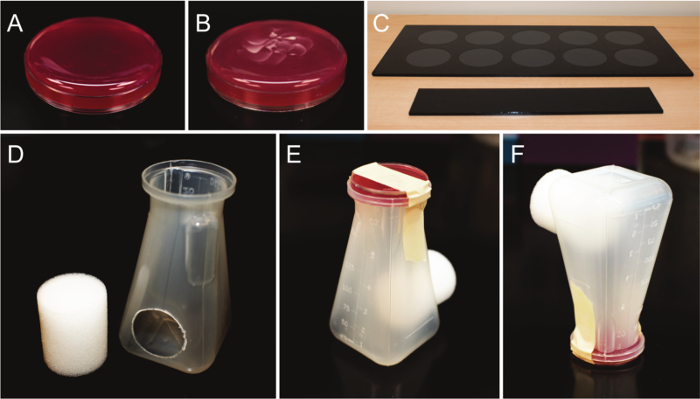 The use of Petri dishes and glass spreader presented the advantage of a very thin layer of yeast, which yielded very long path-lengths and exacerbated the differences between the rover and sitter phenotypes. The use of Plexiglas plates resulted in overall shorter path lengths, but rover-sitter differences were maintained and equally reproducible. 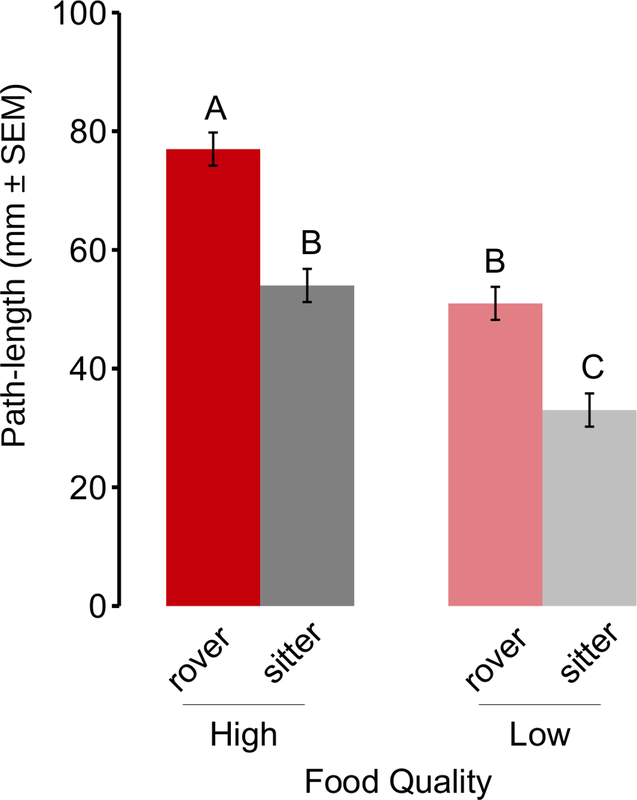 Although the use of Plexiglas plates is much less laborious, the longer path-lengths obtained with the Petri dish method allowed for better separation of the rover and sitter phenotypes, facilitating the genetic mapping of the rover-sitter difference to the for gene3. The use of Plexiglas test plates instead of Petri dishes, and computational analyses of path-length traces are the major changes made to the protocol since the method was first developed, and have greatly increased the numbers of larvae that can be tested by a single person, as well as the speed of data analyses. We have also improved our knowledge on several experimental and environmental factors that that can affect the outcome of the assay, some of which are outlined below. Firstly, this assay measures individual differences in path-length behavior on a foraging substrate (a yeast-water paste). Significant differences in this assay could result from defects in general larval locomotion. This can be controlled for by concurrently assaying for larval locomotion behavior on non-nutritive agar plates. If strain differences are maintained on agar plates, it is safe to assume that differences found on a yeast-water substrate are not foraging behavior specific. It has been previously shown that while the rover for allele confers significantly longer path-lengths on yeast, rovers and sitters do not differ in the absence of food, as they exhibit similarly long path-lengths on agar9. Moreover, because larvae generally increase their locomotion in the absence of food, finding little or no movement on agar plates is likely indicative of defects in locomotion. Since food-independent movement defects can act as a confounding variable when investigating foraging behavior, agar control can reduce false positives in genetic screens10. It is also important to note that if larvae were damaged before testing, they might not move at all. Immobile, dead or damaged larvae can be distinguished from healthy larvae by observing mouth hook movement. Immobile larvae without any mouth hook movements should be discarded. Second, as with other behaviors, larval path-length can be affected by environmental factors that need to be considered and controlled for when performing this assay. Environmental factors known to affect path-length include rearing temperature, humidity, food quality, rearing density, yeast paste thickness, haphazard differences between days, and the handling of larvae. Larval development and age at time of testing also affect path-length11. As shown in Fig. 4, raising larvae in lower quality food decreases path-length. The use of one of the fly food recipes described in this protocol or another dead yeast recipe that is equivalent in its nutritional content is recommended. It is also suggested to avoid high or low density rearing environments by always seeding food plates with 100 larvae and spacing them out evenly on the food. Rearing larvae at high densities limits the availability of food and delays larval development, which can result in developmental differences between larvae at the time of testing12. Low density rearing conditions can also affect development since Drosophila larvae may form social foraging groups to break down food and increase foraging success13. When larvae with mutations that affect larval size are assayed, it might be necessary to account for these effects by calculating path-length as a function of larval body length or perimeter. In all cases it is important to ensure that larvae have not transitioned into wandering stage when they are being tested. If larvae move up onto the Petri dish lid during the test, it is likely that they are wandering and the experiment should be discarded and repeated with younger larvae. Another factor worth mentioning is the consistency of the yeast paste used in path-length testing since it affects the crawling speed of larvae. Larvae tested on a thick yeast paste will have shorter path-lengths than larvae tested on a more aqueous yeast paste. Furthermore, stochastic differences between test days also impact absolute path-length scores. It is imperative to randomize the order at which strains/genotypes are tested within days and to block them between days. Finally, care should be taken not to stress larvae prior to path-length testing. Two stressors that are commonly introduced through handling are starvation and drowning. As shown in Fig. 3, starving larvae prior to testing decreases path-length, and although starvation can be introduced as an environmental manipulation, its inadvertent occurrence should be avoided. Stressing larvae should be avoided by working gently but quickly, thus limiting the amount of time spent collecting, cleaning, and transferring larvae. Since larvae exhibit negative phototaxis14, intense light can also act as a stressor and the assay should be done under even, diffuse lighting. Despite the multiple environmental factors that can alter path-length, it is important to note that although absolute path-length scores are susceptible to environmental conditions, relative differences between strains are maintained when all individuals are treated equally. Accuracy, efficiency and robustness in quantification are at the heart of studies aimed at understanding the genetic and environmental factors that mediate behavior. The Drosophila larval path-length assay offers all of these advantages in addition to being low cost, high throughput, and easy to perform. As such, this assay can be widely used for genetic screens to identify the molecular and genetic pathways associated with behavioral responses. Furthermore, the assay can be applied to toxicity testing or pharmacological screens, or adapted for teaching in the classroom. The authors acknowledge continued funding the Natural Sciences and Engineering Council of Canada (NSERC) to MBS. Behavioral Genetics of the Fly (Drosophila melanogaster). Dubnau, J. Cambridge University Press. New York. 173 (2014). Sokolowski, M. B. Foraging strategies of Drosophila melanogaster: a chromosomal analysis. Behav Genet. 10, 291-302 (1980). de Belle, J. S., Hilliker, A. J., Sokolowski, M. B. Genetic localization of foraging (for): A major gene for larval behavior in Drosophila melanogaster. Genetics. 123, 157-164 (1989). Osborne, K. A., Robichon, A., Burgess, E., Butland, S., Shaw, R. A., Coulthard, A., Pereira, H. S., Greenspan, R. J., Sokolowski, M. B. Natural behavior polymorphism due to a cGMP-dependent protein kinase of Drosophila. Science. 277, 834-836 (1997). Kalderon, D., Rubin, G. cGMP-dependent protein kinase genes in Drosophila. J Biol Chem. 264, (18), 10739-10748 (1989). Reaume, C. J., Sokolowski, M. B. cGMP-dependent protein kinase as a modifier of behavior. Handb Exp Pharmacol. 191, 423-443 (2009). Schindelin, J., et al. Fiji: an open-source platform for biological-image analysis. Nat Methods. 9, (7), 676-682 (2012). Pereira, H. S., MacDonald, D. E., Hilliker, A. J., Sokolowski, M. B. Chaser (Csr), a new gene affecting larval foraging behavior in Drosophila melanogaster. Genetics. 140, 263-270 (1995). Shaver, S. A., Riedl, C. A. L., Parkes, T. L., Sokolowski, M. B., Hilliker, A. J. Isolation of larval behavioral mutants in Drosophila melanogaster. J Neurogenet. 14, 193-205 (2000). Graf, S. A., Sokolowski, M. B. The rover/sitter Drosophila foraging polymorphism as a function of larval development, food patch quality and starvation. J Insect Behav. 2, 301-313 (1989). Gonzalez-Candelas, F., Mensua, J. L., Moya, A. Larval competition in Drosophila melanogaster: effects on development time. Genetics. 82, 33-44 (1990). Durisko, Z., Kemp, R., Mubasher, R., Dukas, R. Dynamics of social behavior in fruit fly larvae. PLoS One. 9, (4), e95495 (2014). Sawin, E. P., Harris, L. R., Campos, A. R., Sokolowski, M. B. Sensorimotor transformation from light reception to phototactic behavior in Drosophila larvae (Diptera: Drosophilidae). J Insect Behav. 7, 553-567 (1994). de Belle, J. S., Sokolowski, M. B. Heredity of rover/sitter: alternative foraging strategies of Drosophila melanogaster. Heredity. 59, 73-83 (1987). de Belle, J. S., Sokolowski, M. B., Hilliker, A. J. Genetic analysis of the foraging microregion of Drosophila melanogaster. Genome. 36, 94-101 (1993). Sokolowski, M. B., Pereira, H. S., Hughes, K. Evolution of foraging behavior in Drosophila by density dependent selection. PNAS. 94, 7373-7377 (1997).